Chee’s attention to Mary becomes background as a crime takes place. Albert Gorman, a Navajo who moved to L.A. and became a car-thief, returns to the Shiprock New Mexico and the reservation looking for his brother Leroy and is wounded in a shootout. Albert runs but is eventually found dead in his grandfather, Hosteen Begay’s, Hogan. Both the grandfather and Leroy are missing and Margaret Billy Sosi, one of Hosteen Begay's grandchildren, also has disappeared from her Navajo school. Jim goes to LA to try to find answers and learns of the two Gorman brother’s involvement in a local gang there that Leroy had agreed to testify against. Granddaughter Margaret Billy Sosi had also gone to LA and when she and Jim meet up the granddaughter saves him from a killer but then gets away and goes back to New Mexico. Jim returns home and tries to tie the clues he has together. The mystery unfolds but it has many twists. The final twist is a help to Jim with his own decision about Mary. 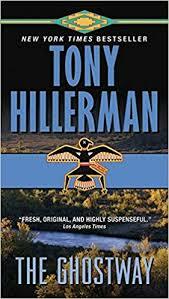 For those that know New Mexico and something about the Navajo culture Hillerman’s books prove authentic. Time in Shiprock, the Reservation and the use of Indian lore in the plot makes his stories compelling.